Director Jim Jarmusch once said,’’ I have no desire to make films for any kind of specific audience. What I want to do is make films that… tell stories, but somehow in a new way, not in a predictable form, not in the usual manipulative way that films seem to on their audiences’’. Filmmakers like Jarmusch, Terry Zwigoff and Henry Jaglom (and many more) have been making their films…telling their unique stories for decades, with characters that are more real to us the audience then we’d probably care to admit. These are characters we know, people we see every day, people the filmmakers hint we may even be. Their stories and approaches may not be for everyone, but they are their stories and if you’re to look at the canon of the aforementioned filmmakers’ works, you’re never going to see them copy themselves. Every story is fresh, different and imaginative. It always amuses me though that because these filmmakers works are not ‘’mainstream’’ in the Spielberg / Bruckheimer sense that marketing people, who usually miss the mark when it comes to really breaking down a film, any film, feel the need to slap labels like ‘’quirky’’ or ‘’edgy’’ on them to help in sales and promotion. Dear Marketing People: Those two words are like nails on a blackboard to independent artists. Consult a thesaurus and find new words. I know Jim Jarmusch despises the words ‘’quirky’’ and ‘’edgy’’ when critics talk about his films and independent film in general , so I will do writer / director Meg Skaff an incredible service in the following review of her short film Terry Kendall and Orange Green and not refer to her work as ‘’quirky’’ or ‘’edgy’’. I will say at the start that it is an extremely well made short film. Skaff’s short, which clocks in at around 15 minutes, takes a glimpse into the life of vibrant twenty-something Terry Kendall (Brit-Charde’ Sellers) who goes about her life in a typical twenty-something fashion. She works hard and is a highly regarded employee at her local supermarket, but when a mysterious man (Timothy J. Cox) begins to stalk her at the supermarket and in the park on her days off, her life begins to unravel. Skaff doesn’t shape her film as a mystery / suspense film like one would imagine from that description. Her film does not feature a frightening Jerry Goldsmith-style musical score to titillate and keep the audience on edge, but instead Skaff shapes her film as a sort of slice of life piece about a young woman trying to survive her every day life, who happens to be pursued by a stalker. This works wonderfully as when the surprises do happen, you as the audience are and should be taken by surprise as well. The casting of Timothy J. Cox as the stalker sells this point, as Cox, who is not an intimidating looking man, but a kindly looking, average sized man, so rather than frighten with size, Cox’s stalker instead manages to menace actress Brit-Charde’ Sellers, quite good as Terry, with charm and perhaps most frightening of all, silence. While stalking Terry at the supermarket, Cox just stares at Terry, sometimes smiling, sometimes not, often asking the same question over and over again ‘’Can you tell me where the chicken breast is?’’, slowly driving Terry insane. It’s a great performance and Cox is to be commended for finding more to do with the stalker role than just go the ‘’crazy, insane’’ route. The Bedford-Stuyvesant area of Brooklyn is where the film is set and Skaff uses it to great effect, especially the Pioneer Supermarket, where most of the film takes place. Skaff’s camera work is solid throughout, especially in a superbly shot, well lit sequence at the end of the film, during a confrontation between Terry and the stalker. Definitely not predictable or manipulative, Terry Kendall and Orange Green is a truly original, imaginative film, crafted wonderfully across the board by smart young writer / director Meg Skaff. 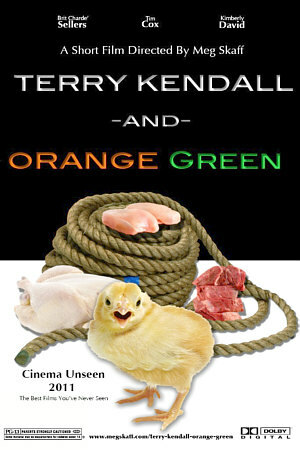 Comments for Short Film Review: Terry Kendall and Orange Green (2011) are now closed.